The full rolls of oilcloth are 12 yards or 10.97 meters long. The oilcloth varies in width but is between 46" and 47" wide. 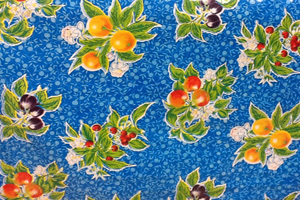 A tasty fruit salad on oilcloth. The Oilcloth is 47" wide. This is a 12 yard roll of oilcloth. By ordering the 12 yard roll you save 10%! Lead time: We have a large inventory, but do not always have 12 yard rolls in stock. If we have to order the roll, it can take us up to 2 weeks to ship your order. If you have a tight deadline, please email us to check our current stock. Don't need a full roll? CLICK HERE for oilcloth sold by the yard.